Notes: Taper week... kind of...not sure what happened.... Flying out to Arizona in a few days to run the San Tan Scramble 50k. I also wrote an article for "The Running Mike" website called, "Why Ultra?" Mon: 32 mi; 3,850' vert; Superior to Boulder via Marshall Mesa, Eagle Loop, Mesa Trail to Chatauqua and back through Community Ditch; Excellent weather and dry trails except a few short sections of ice on Mesa. Staged a bag of water/gels at S. Mesa. Just a great day to be on the trail. On days like this, I have no concept of time. Tues: 10 mi; Dry Creek Trail; The weather continues to cooperate. Despite some 10-20 mph wind gusts, the conditions are still quite awesomesauce for this time of year. Ran out n' back on Dry Creek. 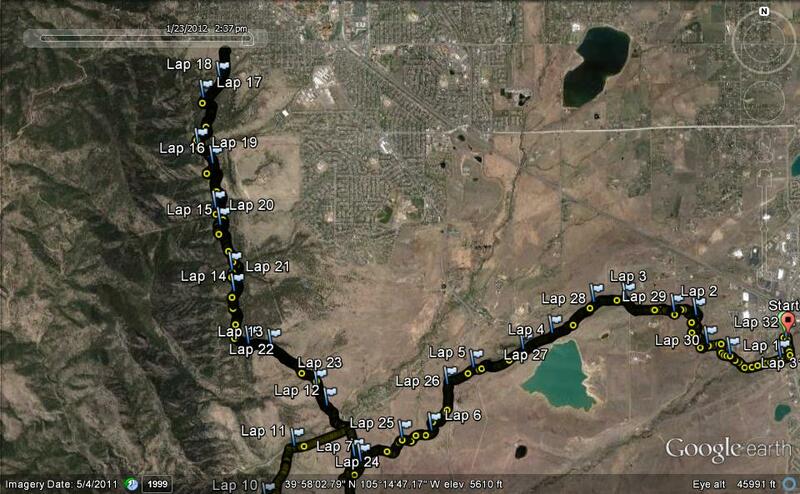 Wed: 2 mi; 500' vert; NCAR, Mesa Trai; Taper run with my 5 year old son, Jalen. Some very strong winds but it was a shorty anyway. Thurs: 10 mi; N. Table Mesa Golden, CO; 1,000' vert; Excellent winter conditions. Ran with Jeremy and the GoPro camera. Fri: 2 mi; Dry Creek; I've run every day this year (2012) in cooperation with Sherpa John's "Streak" challenge. I thought it was simply a silly little challenge, but I've begun to see it differently. In short, the 'streak' requires a minimum of 2 miles per day...and I've come to realize that if I can get myself outside to run 2 miles...then I will find the motivation to run longer regardless of weather. Being on the trail every day, even if just for a few minutes, is time to find peace. It is too easy to become enveloped by the hustle of the urban life. For this reason, I intend to continue running every day. Sun: 2 mi; Barefoot w/Jalen; We run out 1 mile, eat chocolate, and run back. What's better than that? I love my kid. Nice week Jerry. I'm jealous.